This morning I fully intended to ride my regular commuter bike – El Toro (as I’ve deemed her) – with new narrower bullhorn handlebars and a new stem for better reach/height (more about the commuter fitting I got coming soon). However, a few snafus during the part swap led to El Toro taking a few days off and me putting the Green Machine (last year’s winter bike) back into service. Perfect timing, too, since flurries danced through the air as I rode to work. I know it’s winter in Chicago when the extra layers get added to the wardrobe and I take time to consider the bike choice (since last year I’ve chosen to ride the mountain bike in winter) and tire choice (should I add studded tires this year?). In fact, with my extra winter layers on, I’ve been told I’m not recognizable by folks who never see me sporting the helmet, jacket, balaclava, gloves, boots, etc. The layering process is a post for another day, but wisely selected layers are invaluable. My choice to switch to the Green Machine came after a couple of winters on my old ten-speed and doing some research on how other riders battled the elements. Ideally, I’d love a Pugsley, especially after reading about it on the blog Up in Alaska; if she can ride in Alaska, I can certainly ride through Chicago’s winter! What bike do you ride in the foul elements? Anyone got experience with the studded tires and their effectiveness on snow/ice? Each year and each season I continue add to my arsenal and my knowledge as a bike commuter. I commute by bicycle all winter on a Surly Cross Check with fenders and 700 x 35 Nokian Studded tires. I couldn’t ride all winter without the studded tires. The studs are needed for the ice. However, they do little for snow. The knobby tread helps in the snow. I also have a Surly Pugsley, but since it doesn’t have fenders (four inch wide tires throw up a tremendous amount of crud) it’s mainly used for riding on the local snowmobile trails after work and on weekends. Doug…good to see you over here! When we get emailed winter questions, we often refer the emailer to your blog (after all, what do Floridians and southern Californians know about winter?). Glad to see that Elizabeth is picking up a bit of our slack and winterizing away!!!! I have a foul-weather bike, but it’s never seen snow as long as I’ve owned it — full-coverage fenders and parts that I don’t mind getting rusty/dirty/corroded. a few winters ago my choice of steed was a 40 year old Raleigh with 27in wheels. That was a bad choice in snow. Now I ride whatever mountain bike is handy, current steed is a 20 year old Diamond back. Knobby tires (no studs), fenders, extra blinky bits and I conquer my northside jaunt to the Metra. Oh did I mention my route is primarily up Elston, so it’s usually plowed. The few side streets I hit are so-so for riding. I just need a rut and a patient driver behind me! You know I’m a strong proponent of studded tires. They’re worth it for the peace of mind alone, and I really can’t imagine riding without them. I guess most of the Chicago ice is avoidable by taking major streets, but I prefer sidestreets and the trail. I wussed out today. I have my winter layers, including balaclava and booties, even in Memphis. What spooked me was the wind. I tried riding against 12-15 mph winds the other day and it was the first time I almost walked my bike, so I chickened out when the wind was over 10 mph and the chill was about 30-degrees. I just ride the same bike I always use, an old Giant MTB/Xtracycle with road tires, or my Swobo Novak. Like Ghost Rider’s area, Memphis doesn’t get much snow, though it does get chilly. Someone just send me some guts so I can brave the morning ride north against the wind this winter. @Zach, come to Chicago and practice against the winds. The headwind out of the north the past two nights – ouch and brr. Tomorrow’s weather forecast predicts windshield only in the 10-15 degree range. Send me some guts, too, to go out into that chill. @Dottie, I guess I haven’t yet missed studded tires since I tend to stick to the main roads, like Lincoln. But I really fear ice and my bike sliding out from under me. @Sean, I may have to get the knobbies back on my bike soon. Luckily we only had a dusting of snow this evening, but your right about the tread helping with the snow – and slush in the bike lane. The ruts are good if the snow isn’t the kind that slides out from under you. I throw studded tires on my touring bike and am ready to go. They seem to make all the difference here in central PA where we get a lot of ice and slush. PP, although central PA isn’t pleasant in winter, it’s these Chicago/Minnesota/Wisconsin commuters that earn my respect. It’s Moscow cold up there. Yep, studded snow tires this year. I resisted in the past, and that meant that there were a few weeks where I didn’t bike. And I really missed it. Regular knobbies work quite well on snow, but when that gets packed into a sheet of ice, you have to have studs. I live in Anchorage AK and commute all year on a cross bike. It’s a mid 80’s Fuji hybrid that, like Doug, I put 700×35 Nokian studs on for the winter months. As you can imagine, there are a fair amount of Pugsleys up here and, though I think they are fun to ride on trails, they are sluggish on the street and would be overkill for strictly city commuting–not to mention expensive. If you’ve got the dough it’d be fun to pick one up for recreational riding on trails and such but if your only plan for one is city commuting, save the cash and storage space. Fair enough dukiebiddle. I take your point (and hats off to sqrl for all year commuting in Anchorage!). In a good way of course… but I guess it is all in what you are used to! A road bike is faster and easier to peddle, but a full loaded mountain bike gives you options like hopping curbs, surviving the “ditch or car” episode, having a change of clothes and tying the chair you found on the side of the road to your bike rack..
My problem was always going uphill in snow. The front tire would slide out. Maybe the ultimate winter commuter would have a 26″ studded tire on the back, more weight distribution towards the front and a little 16″ studded tire in front to punch through a snow layer. i can only afford one bike right now, and it’s my trusty Specialized MTB. it’s been really cold and icy lately, and after eating some black ice a couple weeks ago, i dropped my air pressure down to 40psi (usually run them at about 70psi unless i’m going to ride a lot of off-road and trails.) it made a noticeable difference in traction, at least on rough/snow covered ice and plain snow. i’d take them even lower, but they’re rated at a minimum of 30psi and i don’t want to risk a pinch flat when it’s 15 degrees and dark. i’ve also started slowing way down and putting my legs out like outriggers when i come to a large patch of unknown winter accumulation. at least if i feel myself falling, my foot’s got a better chance at keeping me from going completely down. i got the “outrigger” idea from something i remember reading on Sheldon Brown’s website a while back, and it really does seem to work for me. I mentioned that I ride a cross bike to illustrate the fact that you don’t need a Pugsley w/ 4” tires to ride the city in winter. Mountain bikes work great for winter riding – especially w/ studs. I don’t mountain bike any longer as I have a jacked arm from being hit by a car and when my mtn bike was stolen, I never felt the need to replace it. As I don’t have the scratch or space for another ride, my choices were to stud my Fuji or my 70’s Schwinn Collegiate. I opted for the Fuji because it could house wider tires. Cat, as Jeff mentioned, it’s pretty cheap and easy to make your own studded tires. If you’re looking to buy, I picked up mine for $80 (that’s the price for the set). Anyone charging $100 a piece is ripping you off. In Stockholm I ride an old Crescent 4-speed during the winter. Schwalbe studded tires 28 mm wide provides me with the necessary contact. And of course a lot of illumination due to blind drivers. I had talked to a LBS sales person about studded tires. They liked them on the ice and they helped a great deal. He told me once you hit dry pavement you tend to slip and slide. If I do get studs I think I will have them on seprate wheels and change them in as needed. For me I ride my Schwinn Masa GSX with 2.4 Mountain Kings and get around fairly well. When I have needed extra grip from them I drop the air pressure. I have a ’94 Giant aluminum mtb, this is my first winter. Front tire is knobby rear is pretty smooth, but I rode last week during the snow and it was fine. 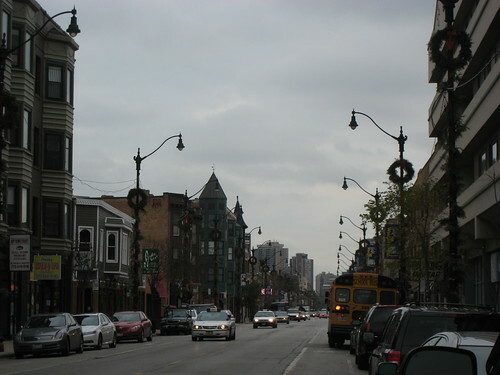 I commute from Lakeview to the Loop. However I recently ordered Schwab Winter Marathon spiked tires worried about ice in the coming months, they should be ok riding on the streets. I hope that is knobby enough and don’t need something more, I guess it depends if there is really really heavy snow or not and I’m out in it. If your looking for a winter bike the best place to get one is at your local Police auction. This is a gold mine for picking up a nice bike for winter riding. 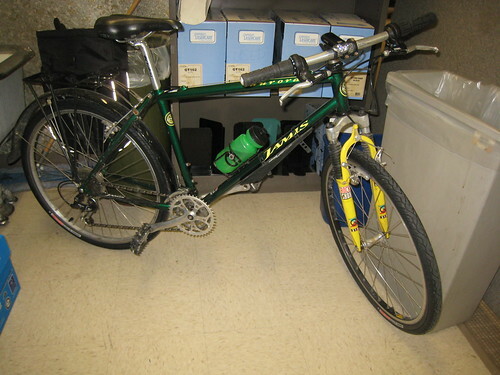 I scored an Author Stratos CycleCross bike for $75 and outfitted with Nokian Studded tires. Now I don’t care how much salt I ride through. It’s a mid-range bike and parts for it are cheap enough to replace every couple of years. My next, or second, winter bike I’ll be looking for an aluminum frame.